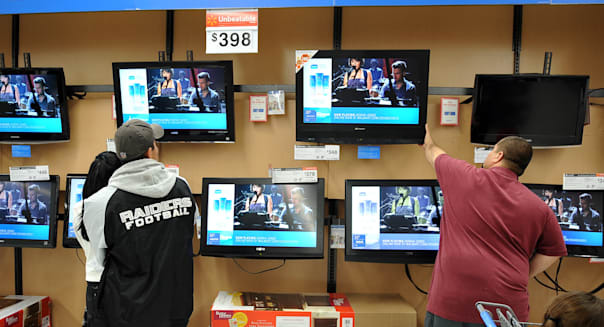 TVs stand out as one of the premiere, big-ticket items of Black Friday. Even Kohl's (KSS), a store known for its clothing (not electronics), will have a few in stock that day, in an attempt to lure in a few extra bargain hunters. With so many different stores running specials, and all the different models on sale, there are literally dozens of different Black Friday TVs to choose from. While there are plenty of great deals available, a few stand out as being particularly noteworthy. Walmart (WMT) will be selling a 32-inch LED Funai for just $98, making it one of the very cheapest TVs on sale this year. Discriminating buyers, however, should likely stay away -- Funai isn't in the same league as Sony (SNE) or Panasonic (PCRFY) when it comes to picture quality, and this particular set is just 720p (in contrast to full-HD 1080p). If you've never heard of Funai, the company generally sells its TVs under the Sylvania and Magnavox brands, two budget names not exactly known for their quality. Nevertheless, $98 for a 32-inch LED is hard (perhaps impossible) to beat. Shoppers looking for the cheapest flat-screen they can get their hands on should plan to be at Walmart Thanksgiving night. At h.h. gregg (HGG), they'll also be offering a 32-inch LED, but unlike Walmart's Funai deal, this is on a model known for its quality. The set, Samsung's UN32EH5300, was declared one of the best 32-inch LCD TVs you can buy by LCD TV Buying Guide for 2012. It sports full-HD 1080p, and comes equipped with Samsung's smart TV suite -- owners can access digital content from sites like Netflix (NFLX) and Youtube. In terms of discounts, BJ's Wholesale has one of the best: It will sell an LG 47-inch LED for $580, about 30 percent off its regular price. Even Amazon can't come close -- it charges nearly $70 more. LG is considered a respectable TV brand, but the set in question (the 47LN5790) is a budget model that hasn't been reviewed by the big websites. Still, it offers 1080p and smart TV functionality. Most interesting, it comes packaged with a separate sound bar, an accessory that's practically become a necessity in the age of paper-thin TVs with low-quality speakers. Even entry-level sound bars retail for about $100. So factor that into your buying decision. The Best Deal on the Biggest Screen? In addition to selling the cheapest TV overall, Walmart will also offer the cheapest large TV -- a massive 70-inch, 1080p Vizio for $998. Like the Samsung and LG sets, it also includes smart TV functionality, giving owners access to Netflix and Hulu without having to attach an external media player. Walmart claims buyers will be saving $700 on the set; indeed, Amazon charges about $1,700 for the TV. In terms of reviews, the reception has only been lukewarm -- PC Mag gave it just 3.5 stars out of 5, lamenting its modest black levels. Nevertheless, shoppers looking for an enormous TV at a rock-bottom price will be hard pressed to find a better deal. Those looking to stay home on Friday, but who still want to buy a TV on the cheap, should browse over to Dell's website. In addition to its own PCs, Dell will be selling a 50-inch, 1080p Sharp for just $498. Normally, that TV retails for closer to $700. Unfortunately, it's just a mid-range set, with a 60Hz refresh rate, making it less than ideal for watching sports or playing video games. But of the deals that have been announced, it's one of the best ones among online retailers. Online shoppers, however, should keep their eyes on Amazon. Though it doesn't preannounce its specials, come Friday, it's likely to have a competitive slate of products -- including TVs -- on sale. Of course, these are just a small sampling of the deals available; other retailers, including Sears (SHLD), Best Buy (BBY), and Target (TGT), have an extensive lineup of TVs on sale. Ultimately, it comes down to personal preference -- are you aiming for the largest TV possible? The cheapest price? Are you willing to pay a little more for a set that's higher quality? Perhaps most important, with retailers' limited inventory, will you be lucky enough to get one? Elmo was popular when I was a kid. He was popular in the mid-90s, when America went insane over Tickle Me Elmo dolls. And with the toy appearing on all three lists, it looks like he'll be popular this year, too. Centuries from now, when humanity has migrated to the stars, we'll still give our kids Elmo dolls for Space Chanukah. Here's another ghost of Christmas shopping past. Kmart and Walmart are both bullish on the latest Furby, which according to the product description "has a mind of its own." It goes on to say that "the way you treat your Furby will shape its personality." Incidentally, you could also describe children this way. Expect to pay around $60 for this one. Doc McStuffins follows the adventures of a veterinarian who operates on stuffed animals, and the dolls and play centers promise to be popular again this year. All three retailers have this playset on their lists, though it should be noted that Toys R Us exclusively has the "Deluxe" version of the kit pictured here. The Deluxe set has 14 bonus pieces, including a fetching pink labcoat. Note that the Deluxe costs $79.99, versus $64.50 for the standard set at Walmart. Toys R Us is building tablet mini-shops in its stores, so clearly it expects kid's tablets to be a big market this season. Both Toys R Us and Kmart have the LeapFrog on their lists this year. The tablets cost $150 and is durable enough to withstand drops, though it's not waterproof. So if your kid is prone to pitching toys into the toilet, steer clear of this one. The Ninja Turtles are going to be big this year. At Kmart you can find this remote-control "Shellraiser" vehicle, which shoots sewer covers and costs around $45. At Walmart there's the Secret Sewer Lair playset, which costs $80. And at its holiday preview event last week, Toys R Us had classic Ninja Turtles figures and their "party wagon" on display. Both Kmart and Walmart list this one, so it looks to be this season's hot Nerf gun. As the coloring and name make clear, it's a toy weapon being marketed to girls, a rare move for Nerf. We're thinking the popularity of archery-centric movies with teen girl protagonists like "The Hunger Games" and "Brave" account for Nerf's sudden interest in selling to the female market. We don't recall Princess Merida or Katniss Everdeen using a hot-pink-and-purple bow, but hey, that's toy marketing for you. This one will cost $15.99 at Walmart. Unlike other fairy dolls, this one actually flies. It must be a real fairy! No, just kidding, it's just a toy. Get it for $30 at Walmart. It takes six AA batteries, which aren't included. Motley Fool contributing writer Sam Mattera owns Best Buy shares. The Motley Fool recommends and owns shares of Amazon.com. Try any of our newsletter services free for 30 days.